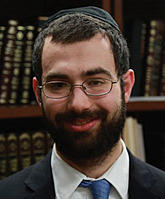 Rabbi Zecharia Schwartz, originally from Baltimore, spent four years in Ner Israel Rabbinical College before joining the Greater Washington Community Kollel. In addition to earning his Bachelors in Talmudic Law from Ner Israel, he graduated with a Masters in Education from Johns Hopkins University. Rabbi Schwartz offers an array of classes in addition to his individualized study sessions. One of his more popular classes explores the various aspects of Genesis, where he shares with the participants ideas that are both creative and profound based on the writings of the Malbim. Rabbi Schwartz’s breadth of Torah knowledge and dedication are a true asset to the Kollel. Rabbi Schwartz’s wife, Efrat, is also an educator, currently serving as an educational aid in the Torah School of Greater Washington.